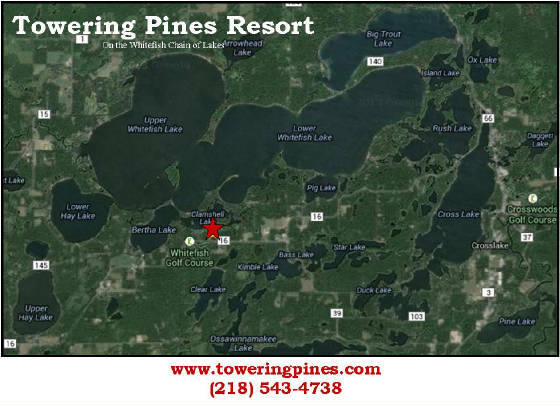 Towering Pines Resort is located on crystal clean Clamshell Lake with easy boating into 14 interconnecting lakes of the Whitefish Chain. On Clamshell Lake you will enjoy convenient access to the larger lakes of the chain as well as scenic landlines which protect us from the strong winds you will find on "the Big Lake". The Whitefish Chain of Lakes is made up of Lower & Upper Whitefish Lake, Pig Lake, Lower Hay Lake, Pine Lake, Bertha Lake, Clamshell Lake, Hen Lake, Daggett Lake, Loon Lake, Cross Lake, Island Lake, Big Trout Lake, Rush Lake and Arrowhead Lake. New to the Whitefish Chain? Topographical $3.00 Whitefish Chain "Where to Catch Em" lake fishing maps & live bait for sale in our gift shop. Plus free-to-take Whitefish Area Property Owner Association lake information!